I would like to start a thread for ideas on repairing a sma 2500u sunnyboy. I have a 10kw PV system 11 years old, 4- 2500 watt strings connected to 4- 2500u SB. One of my 2500u just died and I would like to hear some ideas for fixing it. since I have 3 working 2500u I swapped dc inputs and ac outputs and the problem stayed with the bad 2500u. I also swapped out the ground fault board and the memory/display board and still no change. the green led blinks for a few seconds then the green led goes out and the orange led does it's 5 second light and then it blinks 5 times , the display reads "error: disturbance"
I know that over time the electrolytic capacitors dry out or leak, viewing the board I don't see any indication of any leaking capacitors. I don't have a clue on what to try for a repair. SMA will not repair it, they do offer a discount on a new model (very small discount when you count their shipping charges) you must return the broken SB. There was one person that posted he repairs them. Otherwise, I don't think there was any solution found. Some of these inverters had an EEPROM failure that plugged up the memory causing it to crash, I cant remember what the failure code was but I just happen to have some extra EEPROMs that they sent me back in the day and a recent copy of the eeprom swap out. What are the numbers on your eeprom? PM me as I am not usually here on the weekdays. Yes, I had this eprom problem but then I got the new eprom program and that fixed it. I also got a extra set of new eproms that I still have. I read that thread and I found the guy that does repairs. right now he is selling a REFURBISHED 2500u for $900.00 with a 90 day warranty. I can buy a new sma 3000 tl-us-22 for $1200.00 with 10 year warranty. Hi where are you located? I can probably fix your inverter. Or I have two working inverters in stock. Does anyone have the schematic diagram for these units? I have two SWR 2500U inverters, each with two strings. One of the inverters stopped producing power, green LED is ON...and it is humming...but no PAC power is going out. The other symptom is that the green light remains lit even through the night (and the inverter hums)...so the AC is somehow backfeeding or coupling to the DC side. I would like to dig into this and repair this unit before the next one fails. I'd like to at least do some of the initial trouble shooting, and need a schematic for that. Does anybody have that?? Oh...I called SMA and they told me that the failure I described was a common one. So this must be a typical aging component failure. PROBABLY a capacitor failure...but the other suspects would be a blocking or switching diode. I'll bet it isn't too hard to repair...but if anybody has seen this problem, or can recommend what to check/replace...I would be very grateful. SMA also offered to sell me a new unit for more than $500 more than what I can get one on eBay for...$700 after shipping...so I didn't bite. There is NO REBATE/UPGRADE BENEFIT...so don't bother buying directly from SMA. Feel free to PM (personal message) me if you have the design schematic for these inverters. THANKS! I presume that the Ebay guy repairing the Sunny Boys is "compuhans" because I recognise the text in his current Ebay ads. Some time ago I bought a SB6000 that did not have the (now required) ARC fault detection. I searched and found an external Arc fault detection unit with a relay output and I am in the process of interfacing that to my SB6000. 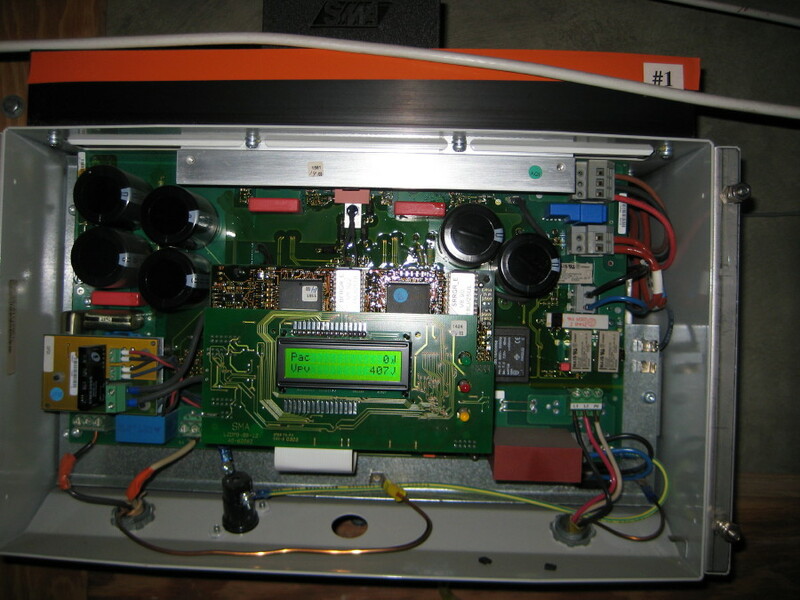 So, I am taking my Sunny Boy apart to trace the circuit that does the ground fault detection and sends the result to the processor. I hope to be able to relate soon how this progresses - both the repair and the addition of the external ARC fault detection unit. BTW, I am also in California, more specifically in Silicon Valley. Is the inverter transformerless or is your system DC grounded? The GF detection schemes for those two situations are very different; you may have a compatibility issue between your inverter and the AF detection device. The SB6000U has a transformer. The AF detection unit is isolated, that is why you can connect it in line with the DC solar string, it responds to changes in current through the DC wiring, those are detected via a magnetic pickup coil similar to a current transformer.